Missing accounts or Seeing accounts and balance as "Inactive" for your Chase connection? 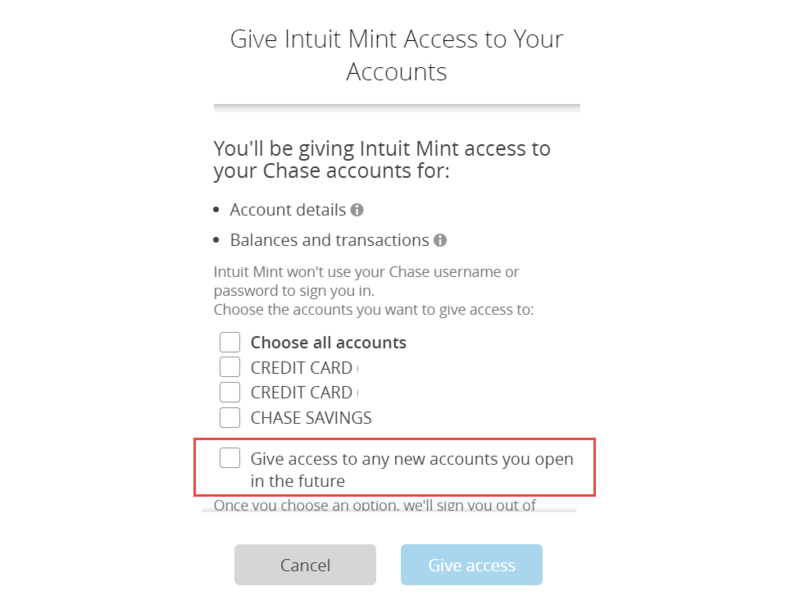 New accounts are not automatically added in Mint. One or more of your accounts are seen as "Inactive" and you cannot change the status. If you have 2 or more Chase connections and you entered credentials of one Chase connection in another while editing. Login to Mint.com and go to “Settings”. Under “Your Accounts” click on ”All”, and find Chase Bank. Above the “Gear” icon, click the “Update Now, Re-link Now, or Edit my Connection button (button differs depending on the status of your account) and re-enter your credentials. Click the "Give Access" button. Open Mint app and go to “Settings”. Under “Accounts”, find Chase Bank and press "Chase Bank"
Press the "Give Access" button. If the above troubleshooting did not resolve your issue, please contact our Customer Support Team using the Contact links below, so we can assist you further. Under “Accounts”, find Chase Bank and click on "Chase Bank"